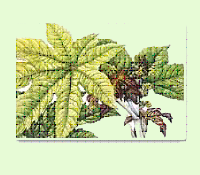 Castor oil is an edible oil derived from the castor bean. Its scientific name is 'ricinus communis' and this plant is not a member of the bean family . Castor seeds contain between 40% and 60% oil that is rich in triglycerides, mainly ricinolein, and helps immensely in moisturizing and lubricating the skin. Since centuries, castor oil has been used as remedies for many disorders. Besides being used as an edible oil, it is also used for producing cosmetics and other personal care products such as night creams, lipsticks, masks, etc. However, its seeds also contain ricin, a poison, which is also present in lower concentrations throughout the plant. Ricin does not partition into the oil because it is water-soluble, therefore, castor oil does not contain ricin, provided that no cross-contamination occurs during its production. India is the leading producer of castor oil in the world, followed by China and Brazil with 0.8 and 0.4 lakh tons respectively. Earlier castor oil was used for lighting by means of torches and candles. Nowadays, it is widely used in many industries as a lubricant. The castor bean plant, 'ricinus communis', is a native to the Ethiopian region of tropical east Africa. It has now become naturalized in the tropical and warm temperate regions throughout the world, and becoming an increasingly abundant weed in the South-western United States. We can locate these plants along river beds, stream banks, bottom lands, and just about any hot area where the soil is well drained and with sufficient nutrients and moisture to sustain the vigorous gRawth. The castor plant may gRaw 6 to 15 feet (2-5 meters) in one season with full sunlight, heat and adequate moisture. Its palmately lobed and large leaves may gRaw up to 20 inches (50 cm) across and resemble a tropical aralia. There are various cultivated varieties with different foliage colorations like black-purplish, dark red-metallic, bronze-green, maroon, bright green with white veins, and just plain green. Flowers occur most of the year in dense terminal clusters, with female flowers just above the male flowers. There are no petals and each female flower consists of a little spiny ovary (which develops into the fruit or seed capsule), and a bright red structure with feathers. Each male flower consists of a cluster of many stamens which literally smoke as they shed pollen in a gust of wind. The castor bean seed looks like an engorged dog tick in size and shape, which is composed of three sections or carpels which split apart at maturity. Each section (carpel) contains a single seed, and as the carpel dries and splits open, the seed is often ejected with considerable force. Castor bean fruit (ricinus communis) is the spiny, globose seed capsule (left) that dries and splits into 3 sections called carpels. Each carpel (right) splits open and forcibly ejects a large seed. Like the faces and fingerprints of people, the beautiful designs on castor seeds exhibit infinite genetic variation. In Food Industry: Food Grade Castor Oil is widely used in the food processing industry. It is used as food additives, lavorings, candy (i.e., chocolate), as a mold inhibitor, and also in packaging. The food stuff industries also use polyoxyethylated castor oil (eg. Cremophor EL) as a vehicle for oral and intravenous administration of water-insoluble compounds. Uses in Medicinal Science: From centuries, castor oil has been widely used as home remedy for many disorders. This unsaturated fatty acid contains ricinoleic acid, a unique subtance with great healing capabilities. Ricinoleic acid inhibits the gRawth of many viruses, bacteria, yeasts and molds. The most common and most frequent of the medical uses for castor oil are the way it is used for treating constipation. Application of the castor oil is also beneficial in cases of ringworm, keratoses, skin inflammation, abrasions, fungal infections, and acne. One study has found that castor oil decreased pain more than ultrasound gel or vaseline during extracorporeal shock wave application. Nursing mothers used to apply castor oil to the breasts to increase milk secretion and relieve milk stagnation in the mammary glands. Consumer Products: Cleaning products, detergents, personal care products, paint strippers, styling gel, adhesive remover, etc. Due to its good lubricity and biodegradability, castor oil is an attractive alternative to petroleum-derived lubricant, but its oxidative stability and low temperature performance limits its widespread use. Its better low temperature viscosity properties and high temperature lubrication than most vegetable oils, makes it useful as a lubricant in jet, diesel, and race-car engines. Highly refined and dried castor oil is sometimes used as a dielectric fluid within high performance high voltage capacitors. It is the preferred lubricant for bicycle pumps, most likely because it doesn't dissolve natural-rubber seals. All the above products are regularly exported by the company in the following packaging. - Tare Weight: 18 Kgs. - Net Weight: 200 Kgs. - Gross Weight: 218 Kgs. - In 20 ‘Feet Container : 16 Mt Net. M. I. V. 0.50 % Max. M. I. V. 0.25 % Max. F.F.A. (as oleic) 1.00 % Max. Acid value 2.00 % Max. Colour on lovibond in 5.25”cell Y- 20.0 Max. R - 2.0 Max. F.F.A. (as oleic) 0.50 % Max. F.F.A. (as oleic ) 0.35 % Max. Acid value 0.70 % Max. Colour on lovibond in 5.25”cell Yellow 9.0 Max. Red 0.9 Max. Design & Developed by M WEB-TECH.